They say that time flies when you are having fun but I think it is when you are getting old, as it doesn’t seem long since it was lambing time and now the entries are closed for the Carlisle sale. In between the society has been busy at the NSA sheep events so I must thank every one who have given their time to man the stands and especially those who found and provided sheep as these are the centre piece of the display. I was at the north sheep and we set up the stand the night before as usual and then went for a meal after which I began to wonder if I would be on my own the next day as our secretary took off after a couple of welsh men who were staying at the same B & B (‘she didn’t know the way’ was her excuse) and Mr & Mrs Gate were very low on fuel and couldn’t find their B & B. Likewise a big thank you to all the members who have turned out at the shows (and those who are still going to show) while it is good to win, it is the rest of the exhibitors that really make the shows worth while for the spectators – and this year has seen some excellent sheep and keen competition proved by the way the prizes have been spread around. However, it is equally important for the judge to select for breed character, confirmation, skins and style and not purely size again to entertain the spectators (I believe another breed is laying ground rules for this reason). I must mention Stephen Dodsworth (Jacob and cheviot breeder) who’s keen eye at the Carlisle rouge sale two years ago picked out and bought a ewe lamb as a wedding present for his cousin “nuffie’s” marriage to Ailsa – so must have been pleased to see it take breed champion and follow by winning the reserve lowland interbreed at the great Yorkshire. Sadly we lost a loyal and dedicated breeder Roger Imlah who will be missed by all who knew him. 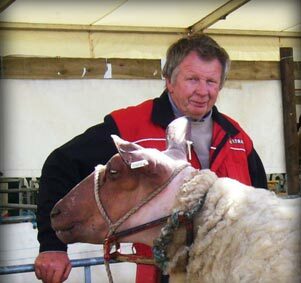 My lasting memory of him was at the Highland after winning the female champion with a ewe lamb and was having her titivated up on the dressing stand ready for the interbreed when Pat insisted Roger went back to her show box for the “broon” soap to wash its face and legs. He duly returned and was to set about the task when Lewis brandished his shears at him and swore – it was a pure delight to see Roger’s cheeky grin as he looked at Pat as if to say “I told you it would be a waste of time”. I think it was his favourite show. We now hope for good sales this year I see there is a big entry at Carlisle boosted by the dispersal of David Jane’s flock which will mean the end of an era. 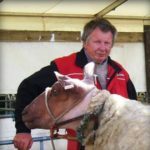 Surely no other breeder has achieved what David has, not only within the breed but in the interbreed competitions at all the major shows around the country. Thank you David. I hope to see many of you at Carlisle – it will soon be here!